Over the past few years I have been doing a lot of research on children with special needs. It really upset me when I realized from my research that a child with a disability is more likely to be physically or verbally bullied than his typically developing fellow students. Bullying has become a serious problem affecting many children and teens, however it is not likely that most children, especially those with special needs, will walk up to their parents and tell them, “I’m being bullied.” Bullying can include name-calling, violence, or exclusion, and must be identified and addressed as soon as possible. The objective is to pinpoint the signs of bullying and take preventative measures against future incidents. This can make all the difference in the life and educational progress of a child with special needs. * Depending on what your child can understand, describe what bullying is, what kinds of behaviour are unacceptable and explain that bullying is wrong. * Some disabled children, who are used to being stared at, receive comments, and remarks, become used to subtle forms of harassment. * Support your child with knowledge! * Tell your child exactly what they should do when bullying happens. * Tell your child to say nothing and simply walk away. Tell them exactly who they should then go and talk to at school if it happens. * Teach your child proper hygiene habits, and outfit them in stylish clothes. * Whether or not your child looks “right,” can make a huge difference with how they are treated by peers. * Your child is already different, so don’t let their clothes and grooming cause further distinction. * Stay in very close contact with your child’s special education teacher, social worker, school counselor, or anyone who is directly involved with your child’s school placement. * Frequently “check in” for reports on how your child is managing amongst their peers. * Ask your child how things are going, and look for signs of depression or negative feelings about school. * You could also enlist the help of another responsible student at the school (a relative, neighbour, or friend’s child) to keep an eye out on your son or daughter, and let you know if anything seems amiss. * When friendships start to flourish, teach your son or daughter how to maintain them. * Have your child invite friends to come for ice cream, or watch a movie. * Your child may need assistance and suggestions on how to be a friend, but do not be too forceful. * Carefully observe whether their friendships are true and not deceitful attempts to take advantage in some way. * A peer tutor can be a role model, school assistant, and protector of your child. * Talk to the special education director in your school district, or the principal. Almost all schools have peer-tutoring programs, which could be extremely beneficial. * Address any problems with bullying that you see. * Explain that the current situation is not working, and changes need to be made. * Be specific. Perhaps your child would do better in a self-contained classroom. * Maybe a peer tutor, classroom change, or schedule adjustment is needed. * Get the school “team” working on the issue. * Students who bully should be reprimanded through the school. I would suggest you work with school officials to address the matter. * Do not contact the perpetrator’s parents yourself. Bullying could be a symptom of bad parenting, so you might not get the results you’d want, anyway. If you disagree with any decisions regarding your child’s education, or how things are being handled, you have options. 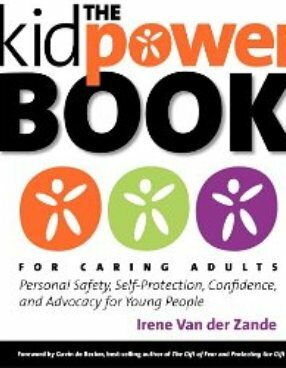 This easy-to-use comprehensive guide puts Kidpower’s 23+ years of experience at the fingertips of parents and all adults who care about protecting children and teens from bullying, abuse, abduction, and other violence – and prepares them to empower young people with skills and knowledge in developing positive relationships, increasing their confidence, and taking charge of their emotional and physical safety. Having problems and need someone to talk to? Kids Help Phone 1-800-668-6868 is Canada’s only toll-free, bilingual, 24/7, anonymous phone/online counseling, referral and information service for children and youth, ages 5 to 20. Kids Help Phone is staffed by caring professional counselors who can offer advice to you on a variety of issues. Whether it is friendships, abuse, bullying, or handling difficult issues with parents and teachers they are there to listen and do their best to help you. 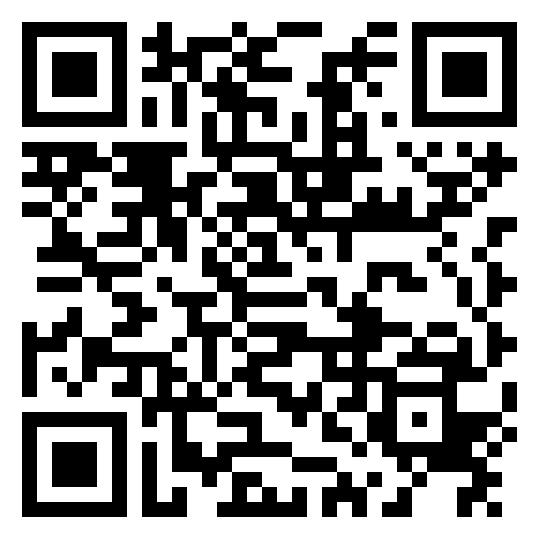 They also have a great website where you can post questions and get information http://www.kidshelpphone.ca. Please be aware that your call is anonymous which means they don’t ask your name and don’t have caller ID, anything you tell them stays confidential. Need Help, call today! (NaNoWriMo) National Novel Writing Month is a writing contest, which was started in 1999 by author of No Plot, No Problem, Chris Baty. The goal of the NaNoWriMo for adults is to write a 50,000-word novel between November 1st, and midnight of November 30. Now NaNoWriMo offers a chance for kids and young adults to participate. Although The word-count goal for their adult program is 50,000 words, the Young Writers Program (YWP) allows 17-and-under participants to set reasonable, yet challenging, individual word-count goals.The contest is open to anyone, whoever reaches their writing goal wins. There are no real prizes per sey but winners of NaNoWriMo have the satisfaction of completing a novel. NaNoWriMo initially began to instigate and inspire writers to create impromptu novels, and it has become an exceptionally successful contest. In fact, many of those NaNoWriMo novels became rough drafts for an eventually published novel. Books such as Sarah Gruen’s Water for Elephants, Night Circus by Erin Morgenstern and Olivia Bean, Trivia Queen by Donna Gephart were all born out of NaNoWriMo. NaNoWriMo allows an individual to silence their inner critic, as it does tend to emphasize quantity over quality. For those writers who are often intimidated by their inner critic the urgency of the contest motivates them to push through fears, the need for perfection and keep writing. With the fast pace of NaNoWriMo, writers need to produce approximately 1667 words per day there is not a lot of time left for editing, although writers who are quick typists could theoretically produce a fairly well edited work in that period. Writers are not limited as to subject matter and any fiction genre is allowed. Percy Jackson meets Indiana Jones in the New York Times bestselling epic adventure Seven Wonders! 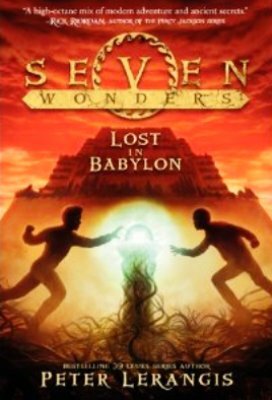 Lost in Babylon is the second book in a seven-book series, chronicling the adventures of Jack McKinley and his race to find the Loculi that have been hidden in the Seven Wonders of the Ancient World. In Lost in Babylon, Jack travels to the Hanging Gardens of Babylon, where he discovers a world out of time and is faced with a dilemma unlike any he’d ever imagined. Rick Riordan calls Seven Wonders “a high-octane mix of modern adventure and ancient secrets. The Colossus Rises is Lerangis’s most gripping work yet. 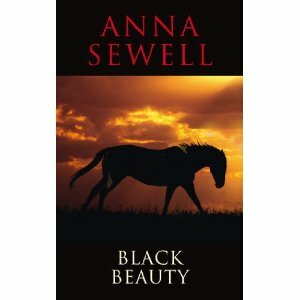 Young readers will love this story. I can’t wait to see what’s next in the Seven Wonders series. 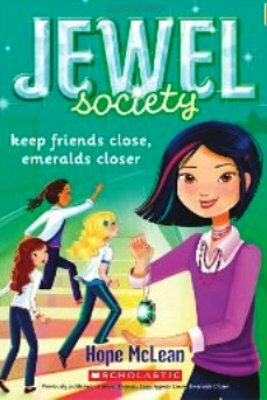 The jewel hunt continues as the girls set out to protect an emerald necklace belonging to a famous reality TV show star. Now all they need to do is keep their enemies at bay — and the race for the Martha Washington jewels will finally be in their favour! But tensions are running high, and with celebrity stylists and TV crews everywhere, the Jewels are finding it hard to concentrate. And it’s not long before their friendship starts to suffer. Thankfully, the Jewels get help from a new top-secret ally. But will it be enough? Can the girls manage to keep the diamond and emerald safe, or will the drama brewing among the best friends break up the Jewels forever? Tell Professor Owl about your favourite character from a book. What would you do if you were able to spend the day with this character? Would you two run from zombies or visit far away lands? Tell us about the types of adventures you’d have. 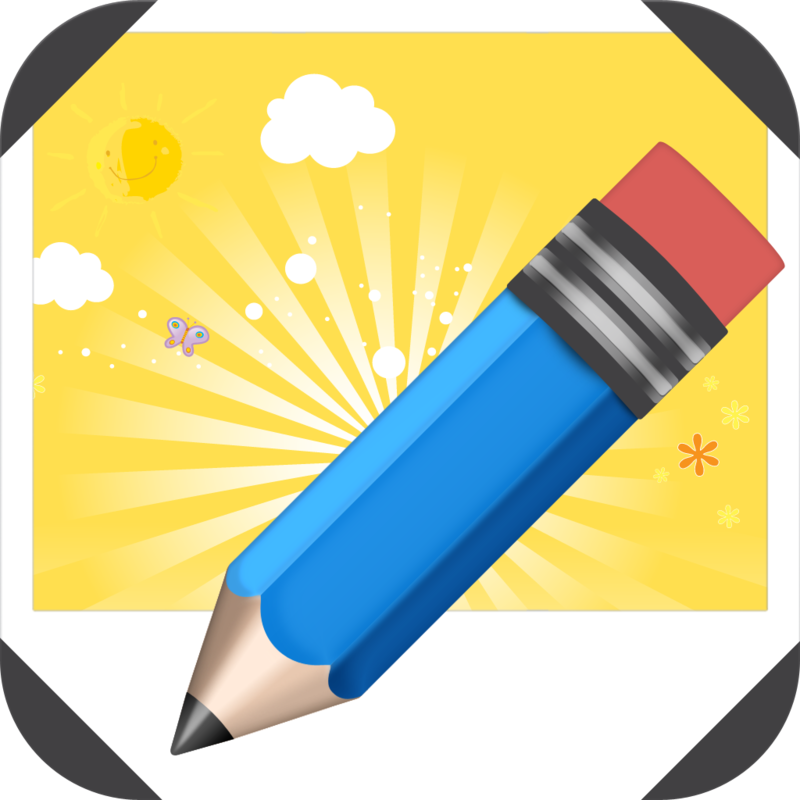 Write About This ~ www.writeaboutapp.com is a great IOS 6 app designed by a teacher to inspire young writers using creative and inventive prompts, sharpening their creativity and writing skills. It’s suitable for a wide age range and varying abilities. 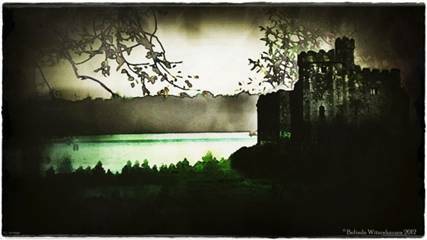 Write About This offers hundreds of inspiring and interesting prompts and the ability to create custom prompts, add. 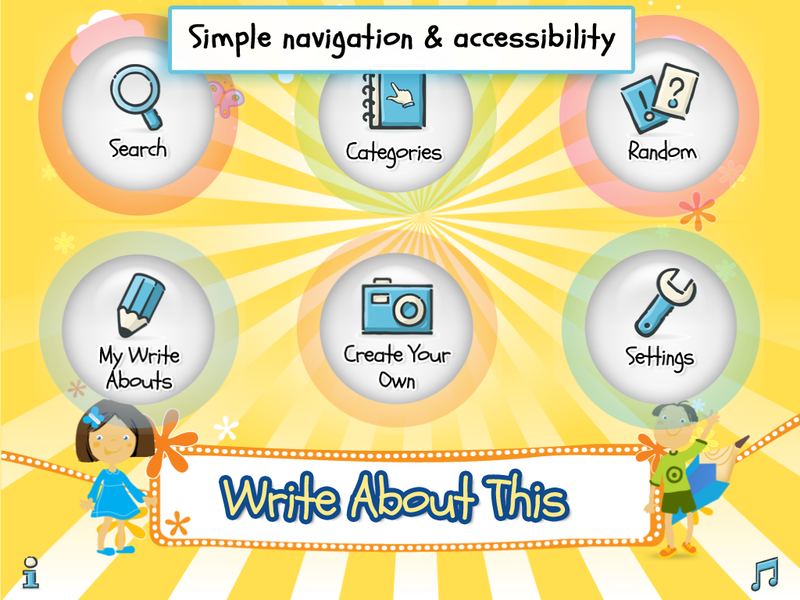 It is a highly useful and flexible tool for home or classroom to encourage children to write. “There wasn’t an app for that”. 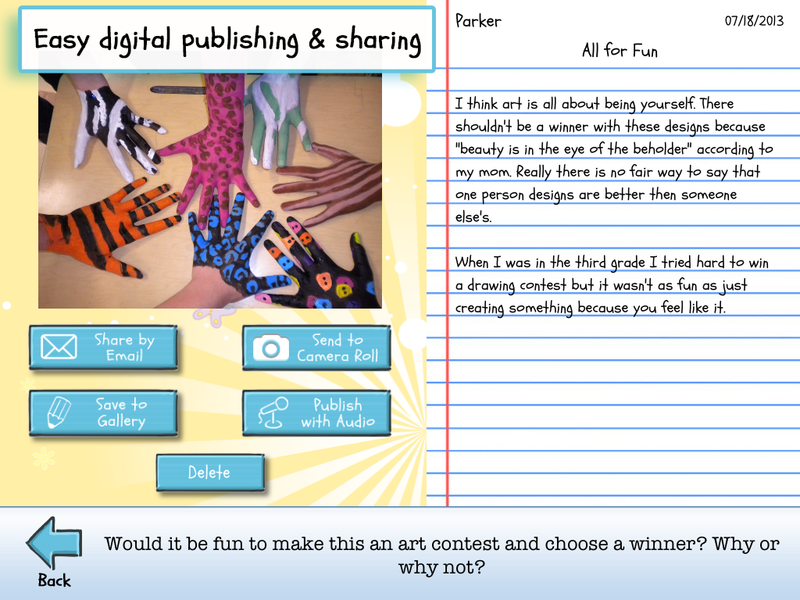 Elementary Teacher builds app to provide a fun tool for creative writing. Official Press Release March 2013 – After years in the classroom continually seeing kids struggle with creative writing, 4th grade teacher and now educational technology consultant Brad Wilson, decided to take matters into his own hands. On a shoe-string budget with input from other teachers and kids, Brad created Write About This. The app combines high quality imagery with intriguing writing prompts to encourage students to write and it also allows teachers, parents and kids to customize the experience. The app includes 125 interesting images and 375 text + voice prompts. You can select from 3 levels of prompts to ensure each student is challenged. The app specifically aligns with the Common Core Standards (K-12 requirements placed upon U.S. States). An unlimited number of custom prompts can be created by using the device’s camera or picture roll and a writer’s notepad is available for kids to save their work in the app. When done writing, their work can be shared via email to their teacher or proud parent. Available on the App Store in two versions: ‘Write About This Free’ and ‘Write About This’ for $2.99 Compatible with iPad and iPad mini. Requires: iOS 6.0 or later. 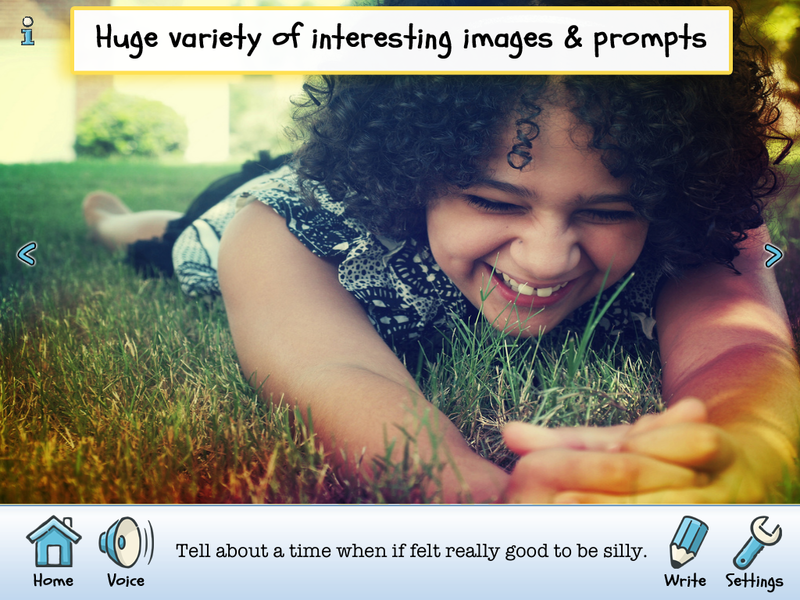 Inspiring kids to write using interesting photo prompts. Darker than the author’s previous novels, this story is about the ultimate cost of bullying with a cast of fabulous characters, dark humour, and a lovable, difficult protagonist struggling to come to terms with the horrible crime his brother has committed. 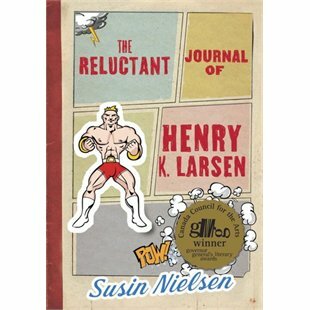 Henry is required to keep a journal by his therapist; he is at first reluctant, then obsessive about it. A born diarist, he exhibits the distinctive voice of a memoirist, one keenly interested in documenting both his inner and outer worlds. He captures both with humour and heart ~ Yet the novel is a dream, and believable a balances of lightness and darkness. It is a book that is hard to put down and in the end to also say goodbye to Henry and his journal. After June and Jeff had left for the day, Casey and Bella decided since the weather was so beautiful they would go outside to play. They peeped over the fence and saw that a moving van had arrived next door and saw their new neighbour a big Doberman. Casey thought he looked very scary but Bella thought perhaps he might be friendly if they took him a bone. They tried to make friends but no way did he want to play and started bully them. “My name is Roscoe! And no. I do not want to play with you because it wouldn’t be any fun.” Roscoe kept on and on while glaring at Bella and Casey, who quickly ran away. What was wrong with Roscoe? The two decided that a scary dog wasn’t what they needed, but that Frisbee was. That was until it soared over the fence and Roscoe grabbed it. Their Frisbee was gone so they decided they would go and visit friends. When they started off on their walk, their friend a wise old owl called Opee arrived. They began to tell Opee about Roscoe, and asked is there any way that Opee could help them with Roscoe? Throughout their journey, Casey and Bella experience three different types of bullying and apply the advice of Opee the Owl to help out their three new friends. 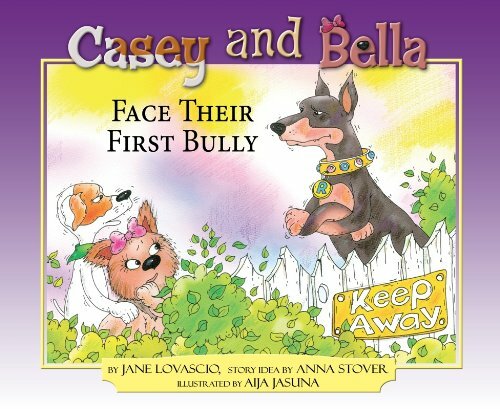 Find out how you can help stop bullying by taking the Casey and Bella Pledge to Stop Bullying and Be Nice to One Another! This is a brilliant little story about bullying that children can learn from. Of course Casey and Bella really don’t know that Roscoe is nothing but a bully, but soon learn than his behavior is not acceptable. For example, Opee tells them “If you are being bullied, make sure you tell an adult right away!” Young children can easily understand or learn what to do about bullying from books like this. Zoela Best is the new girl at school. Trying to get used to the new school and the people, she meets Vincenza Catucci. They are two peas in a pod until the “Jawbreakers” make their presence known and tortures the girls with bullying and hazing. 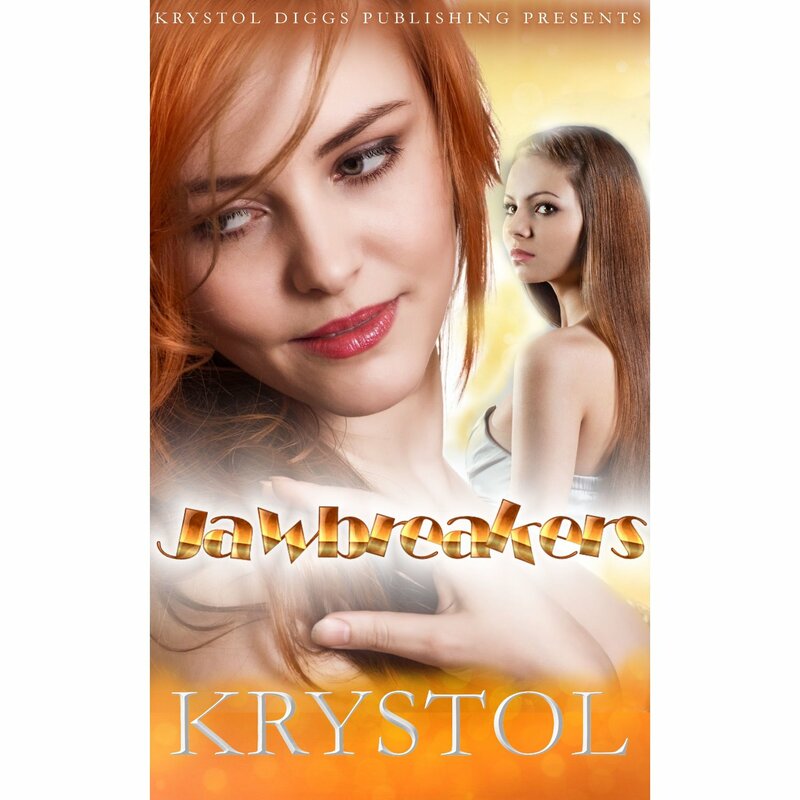 Vincenza and Zoela are asked to be a Jawbreaker and the two are ecstatic. However, the leader has a trick up her sleeve to turn the two girls into enemies. Will they see the danger ahead or will they put an end to the Jawbreakers once and for all? I really enjoyed reading this book, every chapter kept me in suspense as to what would happen next. This book was well written and not only covered a the very important subject of bullying it also showed how easy it could be to give in to peer pressure and drugs. There was a little swearing in the book, but in my opinion this made the story more realistic. I was able to relate to this book as being an “Air Force Brat” that moved around with my family a lot. This meant I had to move to several high schools and had to try and fit in. Even though that was years ago, the problem with gangs and bullying, including peer pressure happened even then. This is a great book for young adults especial new high school students..